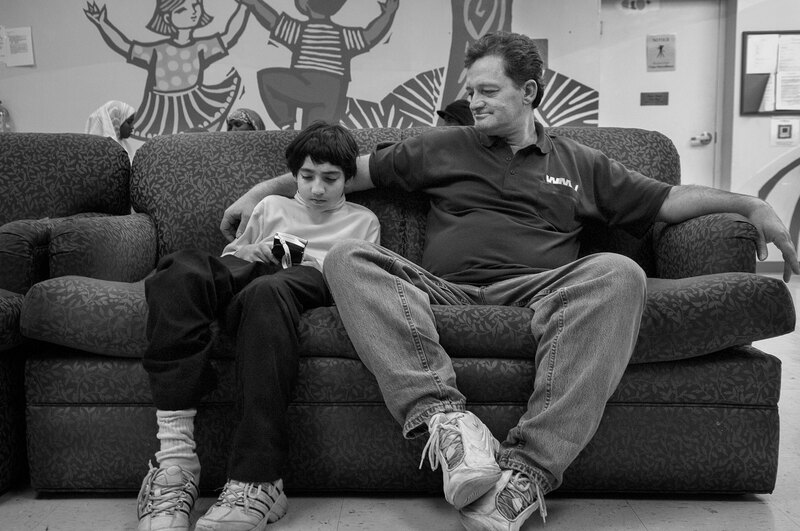 Leonard DeClue, 47, and watches as his son Jeremiah, 9, plays a digital game on the couch in the family area at the Family anhd Adult Service Center in downtown Seattle. The homeless family of Leonard and Angella DeClue and their four boys Jeremiah, 9, Alexander 5 and twins Sean and Darien, 2, spend their days at the Family and Adult Service Center in Seattle. At 8:20 each evening the family must board a city bus for a 40 minute ride to a church which provides them a place to sleep for the night. At 6:20 each morning the family is awakened and by 6:40 they are on a bus heading back to the FASC facility downtown. From there the older children depart onanother one hour bus ride to school while their parents deal with thihe small children and the sometimes daunting bureaucracy faced by the homeless.